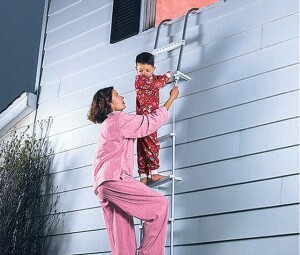 So simple even a child can use it, this panic-proof Fire Escape Ladder is a must for all 2 story homes. Unlike other emergency ladders, the Dial Fire Escape Ladder unfolds instantly without any tangling, becomes rigid when stepped on, and will not sway. Stores easily under a bed or in a closet. Just hook it onto the window sill and pull the tear-away Velcro (R) strap for a quick, non-slip path to safety. Aluminum and plastic design is so lightweight even a child can lift it. Extends to 12′ and holds up to 600 lbs.